This review will be giving you the information you need on what to look for in the best induction cook top popular now, before you spend your hard-earned money. Induction cooking is the process of cooking food by induction heat, rather than by conventional methods, like gas or electric. A coil of copper wire is inserted under the glass finish on the stove top and when a pan is placed on the burner or element than an electric current pass through it. Making it much faster than conventional ranges. Convection cooking cuts out the middle step of having to heat up the burner to heat up the pan. Why choose an induction cook top? 1. They are very fast, you can heat water, say for pasta in under 5 minutes. 2. They are more energy efficient than their counterparts, gas and electric. 3. You have instant control, similar to a gas burner. 4. A breeze to clean, as there are no parts that need to be moved or taken apart, just a flat, smooth surface. 5. Induction cooking is the rage right now. If you are buying a new home or remodeling your kitchen you might want to look at induction stove tops or stoves. 6. Induction cooking is a big help in the cooking department, with everyone life so busy, anything to make life a little easier and simpler. What are the drawbacks to induction cook tops? 1. They are more expensive than traditional stove tops, but the prices are getting more affordable. 2. You will need magnetic cookware to activate the heating element. So you might have to buy different pot and pans. But, check what you have, they might be magnetic, so you won’t need to purchase new ones. Use a magnet to test your current cookware. If, it easily sticks to the bottom of the cookware than you are good to go. They will work on any induction cook top. 3. A humming sound is often heard at higher settings, but that can be minamilized with heavy pans. 4. Also, you have to be careful of the glass top as they tend to scratch easily. Owners of this cook top say it has a good combination of quality and good value. It’s available in black with stainless steel trim or all black. 36 inch cook top has 5 heating elements an 11 inch, and 8 inch, 2, 7inch and 1, 6 inch. The large element has 3,700 watts to quickly bring water to a boil. Roomy surface for ease of cooking. Great temperature control. All the others burners range from 1800 to 3,200 watts. This stovetop features versatile Induction Elements – With up to five powerfully efficient induction elements the Induction Cooktop offers the supberb cooking flexibility. the 10″ induction element offers up to 3,400 watts of power, so you can bring water to a boil quickly. Right Front: 10″ – 2,500/3,400 Watts (Induction) Right Rear: 6″ – 1,500/1,900 Watts (Induction) Left Front: 7″ – 1,800/2,600 Watts (Induction) Left Rear: 8″ – 2,300/3,200 Watts, Indicator Light for hot surface. 4 integrated. Temperature Control is great – You can adjust heat with greater accuracy than on gas or electric cook tops especially at lower settings. More Energy-Efficient Cooking. Induction is 70% more efficient than gas and 20% more efficient than electric. Gentle enough to melt chocolate and powerful enough to heat water in a couple of minutes. Heats the pan only, so food won’t stick to the stovetop. Energy-saving. 70% more efficient than gas. This cook top has 4 cooking elements and 3 of them are high-powerd. This induction cookware provides gentle simmering with rapid heating very similar to cooking with gas. The cooking area is large to accommodate different size pans. A magnetic knob, that can be moved from burner to burner to control the heat. This stovetop also has LED lights on all the burners that look similar to flames glow softly or brightly as you adjust your heating temperatures. Also included is an oblong burner on the side great for odd shaped cookware like casseroles. If you are a techie, this stovetop connects with a smartphone app to allow you to set a timer and even does a check to see if all burners are off after you finish cooking. The Benchmark series comes in 36 inch and 30 inch. They all have the same features. 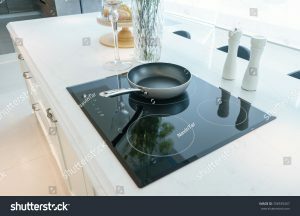 Black frameless induction stovetop has the ability to place your cookware whereever you want on the flexible cooking zone. The 12 inch dual-ring cooking zone accommodates large pot and pans. Powermove, this divides flexinduction into powerzone levels that are preset for smaller pans. Also, features speedboost for added power to speed up cooking time even more. Electric induction cook top has 5 elements or burners. All the elements are high powered with touch controls. Has Wifi capatablities to connect with a smart phone. Plus the flexible elements are designed to adapt to all size pots and pans. A beautiful cook top in all black. It is 30 ” and has4 elements or burners with easy access controls for precision. This cook top has a patented Peacock sliding bar controls with high level selection and automatic power reduction. The Kitchenaid is the most powerful of the induction cook tops that we researched. With 4 individual heating elements, one is 11 inches , one of the largest we researched. The bridge element that connects 2 units into 1 is great when you want to use an odd size cookware , like a griddle. The power range is 1400 watts to 3, 700 watts, the most of any cookware we looked at. The 12 temperature settings gives you a greater range of precision, whic includes a melt setting, good for melting butter and chocolate. But, no warm feature to keep your food warm while waiting to serve dinner. This cook top has touch controls to adjust setting, plus it has safety features to prevent fires. Although conduction cook tops are considered to be very safe. This cook top also has a safety feature that prevents the elements from being turned accidently. You receive a 1 minute warning after a pan is removed , then the element turns off automaticly. There is also an H light to let you know when the surface is hot and everything has been turned off. All in all many good features. I have reviewed a few of the many cook tops available now.These are some of the newest in stoves and cook tops. Hopefully this article has helped you see what is available in induction cookware and you have a better understanding of what’s current. Thanks for all the good info about induction cooking. But I did see that you said it requires magnetic cookware. Can you explain that to me? Why do I need magnetic cookware instead of, say, stainless steel? Some of these cooktops are really impressive! It helps to see them all compared like this, thanks again!